Idaho is one of the most fastest-growing states in the country, so it is not surprising that its metropolitan areas feature an increase in population as well. Today, there is nothing surprising in the decision of moving to Boise, Idaho. The Boise metro area is the 7th fastest-growing in the nation according to the data of the US Census Bureau in 2017 and it has improved its position by 10 points since the previous year and the growth percentage was 3.08% that year. In 2018, it took the 11th place in the same ranking. If to consider the rating by Forbes, this region was ranked number one not only due to the growth of population but also such criteria as employment, salaries, and others. It was estimated that over 40 thousand people moved to the Boise metro area in 2017, and experts agree that net migration plays a key role in the increase of the local population. Where do people move from to settle in Boise? According to the migration statistics between 2012 and 2016, 17% of newly arrived people are from Idaho state. However, all the rest are out-of-state migrants who are predominantly moving to Boise, Idaho from California (23%), Oregon (9%), Utah (9%), and Washington (7%). If to analyze the age of people who relocate to the Boise region, 43% are adults aged between 20 and 44, while the second place is taken by young people under 20, who probably come to study and work there – about 29%. You may wonder what attracts so many people in this peaceful Idaho region. The answer can be found in the list of pros and cons of moving there. Boise is the largest city in the state and a county seat of Ada County. Moreover, it is the most populated city of Boise City-Nampa metropolitan area with the population of over 620,000 people. Boise City is the 99th largest city in the country with about 226,000 people living there. The population density of the city is not high – only 2.59 people per square mile. When it comes to the city demographics, most of the local residents are white (89%). The second place is taken by Latino or Hispanic race (7.1%), the third place is Asian residents who constitute 3.2% of the total population, while African Americans are only 1.5%. Other races living in Boise take 3%. One more feature that differs Boise population from the one in other American states is the largest community of ethnic Basques. There are over 15,000 members of this community living in the city and it is the largest center in the nation. So many people move to this metropolitan area annually, but what are the reasons to move to Boise? In fact, the number of benefits is rather big and all of them seem very significant for movers. It is always great to live in the capital city of the state, but not everyone can afford that. However, Boise is more an exception than a rule. Despite being the largest and most populated city in Idaho, it is still rather an affordable place for living. 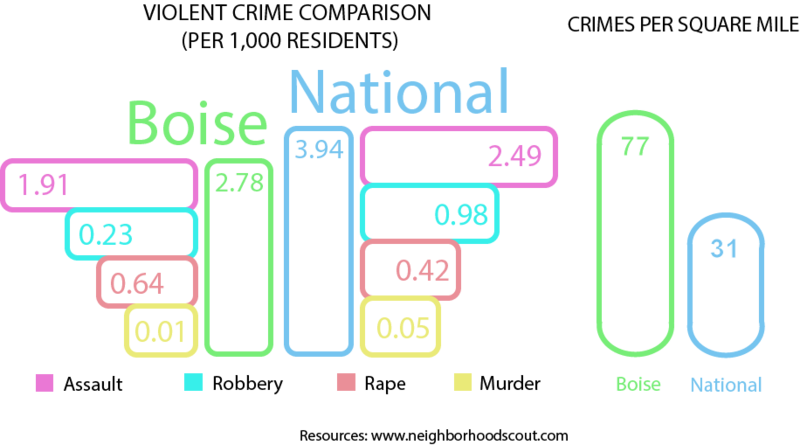 It is natural that the cost of living index is 6% higher than the national one, but the main factor to influence it is housing. All the other factors such as groceries, health, utilities, transportation, and even healthcare are more affordable than around the US. Even if it is not possible to afford a home in Boise, every working person can easily rent a dwelling for a living. Rental prices are significantly lower here than average ones around the country. For example, the average rent of 1-bedroom flat in Boise is $742, while the national average is much higher – $930. 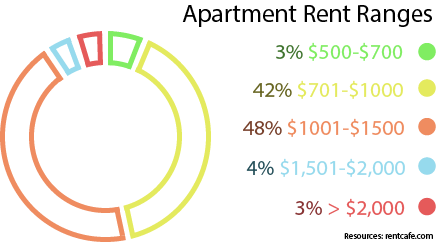 The difference is about $200 in the rent cost for bigger apartments as well. However, Boise rent is continually growing having increase of 9% in 2018. When it comes to job opportunities, it becomes clear why so many people think of moving to Boise. The unemployment rate in the city is only 2.3% – it is lower than in Idaho and around the country. Moreover, the job market is constantly growing because many companies open their headquarters in Boise. The highest salaries are in such industries as mining and extraction, utilities, manufacturing, professional and technical services etc. The major employers are the representatives of healthcare, education, information technology, and retail industries. Featuring a continental climate Boise is a place where you can feel all 4 seasons clearly. There are about 200 days of sunshine during the year and not much precipitation. There is hot and dry weather in summer, while winters are cold and often not snowy. The average summer temperature is 71°F, and the winter temperature is about 32°F. Previously, Idaho was among the least attractive places for education, but this situation has changed dramatically. Now Boise public schools are considered rather challenging and the high school graduation statistics are rather impressive – 94.4% of students in comparison with the national average of 87.3%. Moreover, Boise State University is one of the popular higher educational institutions. Today, the city can boast a very high number of educated people – 40.9% of local residents have a Bachelor degree (the national percentage is only 30.9). The number of college graduates is also higher – 26.6% vs 19.1%. What makes Boise a really appealing place for relocation is its safety. Despite the fact that the state has the 6th highest gun ownership rate, there are little chances to become a victim. If to compare Boise crime rate with the national average one, property crimes are almost at the same level, but the number of violent crimes is lower by one third. For example, Boise was ranked the 8th safest city in the world in 2017 by MSN. The city safety index is 82.29, so you can not worry sleeping with doors unlocked. If you still cannot decide “should I move to Boise?”, your doubts will disappear as soon as you look at the abundance of recreation activities offered there. It can offer everything from thrill to chill during all four seasons of the year. Located not far from the mountains, it is possible to take up mountain biking, rafting, skiing and snowboarding, golf, camping, kayaking etc. It is a perfect place for fishing and hunting, let alone waterskiing and rock climbing. There are multiple youth sports as well as exciting backpacking trips and kiteboarding too. The city can boast unbelievable nature not only outside it but also several spacious parks within the city borders. Several local riverside parks are connected by a 25-mile greenbelt used for running, jogging, cycling, walking etc. There are several beautiful parks with ponds, pools, and benches as well as eye-catching views of mountains scattered around the city. The city is located west of the Rocky Mountains and north of the Great Basin deserts, while the Boise River flows through the city as well. Whether it is a rather low crime rate, a variety of activities to do or city affordability, but local people a very friendly and sociable. Of course, not all of them are happy to see hundreds of people flocking to the city metro area each year, but still, they enjoy their life and feel in this city like home. When you arrive and settle in Boise, you will hardly ever have a desire to leave it. If Boise wine scene has been developing for years, local breweries are popping up in this area. There are several local companies as well as multiple bars to offer beer from the best US breweries. Another popular drink produced here is wine. Idaho has over 8,000 square miles of vineries and 1,800 acres under production, so it will be a mistake not to taste this local product living there. In addition to farmers markets focused on local foods and taking place in the city regularly, Boise offers a vibrant restaurant scene. Here you can taste not only American and Mexican dishes but also try dishes of Thai, Japanese, Indian cuisine and many others. It is impossible to pass by the dozens of local cafes and restaurants that tempt you with mouth-watering smells. Devoting much of their free time to outdoor activities and sports, Boise residents are considered to be a healthy nation. In 2010, the city was ranked the healthiest one in the whole country by Men’s Health Magazine, so there should be no doubts about a necessity to move to Boise. Though the local transportation system is not considered highly-developed, traffic in the city is quite acceptable. Boise commute time is one of the lowest in the country. Experts believe that it ranges between 15 and 20 minutes for the residents of the metro area. Such traffic can be called hassle-free, because many local people use bikes for commuting riding along the Boise River greenbelt. If to analyze the cost of housing in Boise, in fact, it is not that high as in other cities. However, it is still higher than the national one almost by $40,000. The median home price in the city according to Best Places is $255,100 and it is more expensive than on average in the state too. However, Zillow shows less pleasing figures evaluating a median home price at $330,000 and predicting a 1.4% increase in 2020. Moreover, the biggest part of the population can boast homeownership of the value between $100,000 and $300,000. 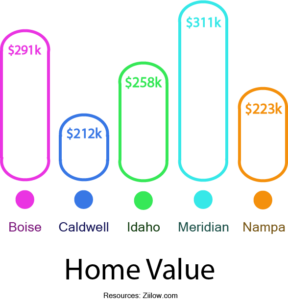 If to speak about the median income per household in Boise, it is lower than the average national one. It constitutes $54,547 that is almost $3,000 less than in other US states. It means that a family will need almost 10 years to buy a house if they save for it half of their income. There are dozens of active volcanoes surrounding the city. The natural geology of the state is more aggressive because many of them are boiling and frothing. Experts say that they will explode within the next thousand years, but nobody knows exactly this time. Are you ready to live on the land that might explode any minute? Unfortunately, the main problem of Boise is an unpleasant smell, so you may hear a piece of advice like “don’t move to Boise”. There are overflowing sewage plants as well as over 170 landfills concentrated in the city, so sometimes the smell is unbearable there. It may not be spotted when you arrive, but living there you will undoubtedly feel that. The report of the United Health Foundation about the quality of air in Idaho is rather disappointing. The state has the second worst air pollution in the country and Boise is not an exception. Its PM is 11.7 micrograms that is 2.2 points higher than around the US. Summer fires make many people suffer from smoke and have problems with breathing too. Though it is difficult to call Boise residents very religious, 44.7% of local residents are LDS people calling them members of Latter Day Saints community. Boise transportation system is not very developed. There is one Interstate 184 highway connecting the city with Portland and Salt Lake City as well as a train that can take passengers to Seattle and Chicago. A public transportation system is not very comfortable. Buses stop running at 6:45 pm and do not work on Sundays at all. The city was planning to run streetcars in the city too. Another downside is a local airport, where the number of destinations to fly to is very restricted. 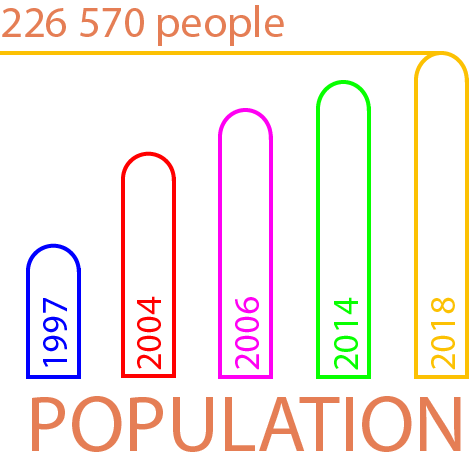 Living in Boise, Idaho can be not comfortable since the city population is increasing incessantly. Many people look for a higher life quality in big metro areas and choose often Boise for this purpose. So when you settle in the city and spend several years of your life there, it may be annoying for you to see how quickly it is growing and to what consequences it leads. Having appreciated all the pros and cons of living in the city, it is time to consider what neighborhood you should choose for a living. Generally, experts differentiate 5 best areas for those who relocate to Boise. Boise is also known as the city of trees and this neighborhood confirms this fact. This area with many old houses is lined with trees and has numerous historic buildings dating back to the beginning of the 20th century. There are two beautiful parks providing an eye-catching view of the downtown. This neighborhood is one of the most expensive ones but also most comfortable for living. There are good schools, many recreation opportunities, and attractions as well as high life quality. Looking for a green neighborhood with rather affordable homes it is necessary to consider Southeast Boise. There are many homes not older than 30 years and several beautiful parks with access to the river and ponds as well as multiple outdoor activities. Being a silent and peaceful place of living, Northwest Boise features a breathtaking scenery of the lake and offers many exciting activities there. It is the place where you can enjoy nature and solitude both in newly constructed and old homes. If you want to be in the center of all the events, have access to small shops, cafes, and restaurants as well as walk along the Basque Block, the city downtown is for you. All the city attractions and cultural events are located there. Are you planning to become one of the happy Boise citizens? Then, it is very important to plan your relocation thoroughly. As it was mentioned, it is not easy to be to the city on public transport no matter whether it is a bus, train or plane, because the number of destinations the city is connected with is rather limited. It is possible to move to Boise on your own car and it will be the most reasonable solution if you take only the most significant items with. But, if you wish to move all your belongings, it is impossible to deliver them carefully without the services of an affordable moving company. California Movers is always ready to give a helping hand to everyone planning relocation and make this process smooth and stress-free. Start a new page of your life story with the belongings that are important for you and we will help to deliver them in the best possible state.